My Craft Projects – …………. ''AND LET THE FUN BEGIN''……………..
We both enjoy doing crafts. Rich and I both have done woodworking in the past. We made projects all the way from small figurines and wall decorations, all the way to doll cradles and shelves. We even had a small space in a craft mall for awhile. Now we are doing other things…..We both learned to do ceramic tile floor. 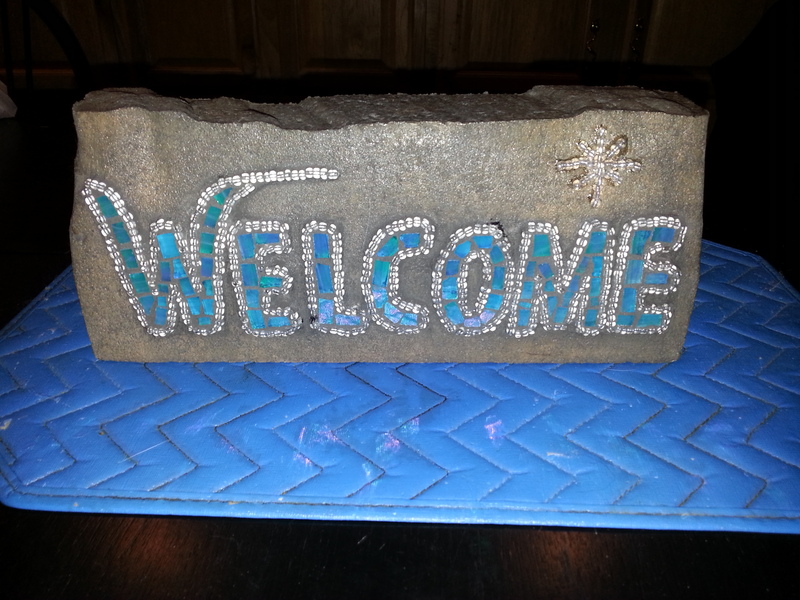 As we continued to do different floor projects, I wanted to make stepping stones. I knew I could do them by applying the same principles, but wanted to learn to do it right. I took a mini class at the local Jr. College on Mosaic Stepping Stones. It was awesome. I made the family stepping stones for Christmas. 16 of them….Wow. Here are some of my stones. 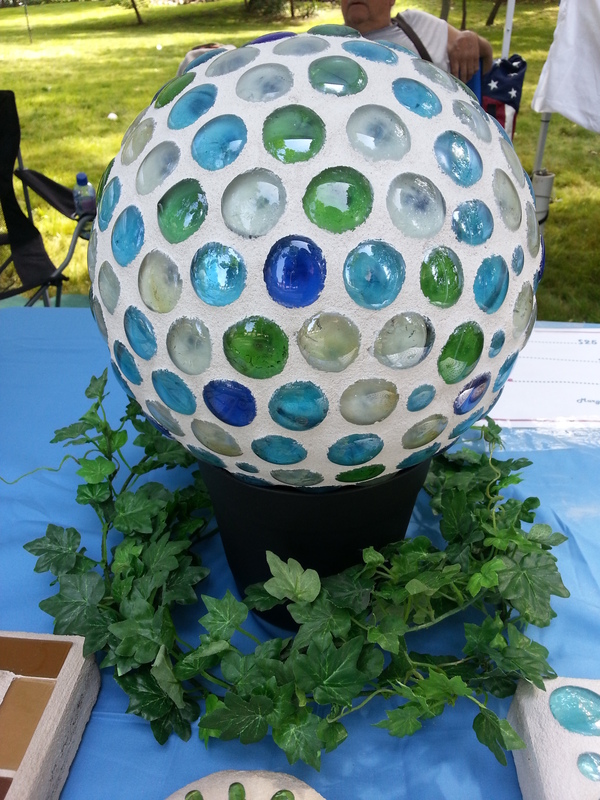 The bottom photo is a Bowling Ball covered with gem stones….First one I ever did….. When we decided to go full time RVing, I knew it would be difficult to do this on the road. I decided to down size. I used bricks and made these next pictures. They can be used outside or inside. I glued felt on the back and bottom. They can be bookends or doorstops. 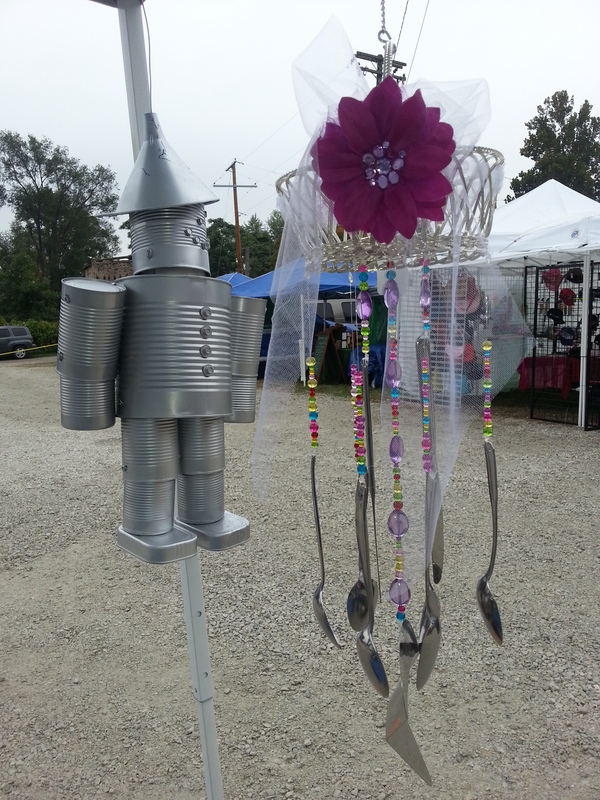 An other Really cool item is silverware windchimes. Now these are really fun to make. I used some old kitchen things like, old time steamers. Rich has made some Tin Men out of tin cans. Really turned out cute. This Christmas I made these for all the familys…. your projects are so cool! never knew you could be so crafty. how in the world did you come up with these ideas. I like the one in the middle with the spoons going up like stairs. Thanks Tammy, They are fun to make….They are all sold, but the one you are talking about was my favorite….The only problem with that one is that they would get tangled cause they were so long…..Plan on making more of them…..very easy…. That one was my favorite as well!! Beautiful! I love the block with cardinal! !